Exhibition Stands, Exhibition Stands UK, Exhibition Services | 200m2 | Exhibition Stand Contractors UK: Who should you choose? Exhibition Stand Contractors UK: Who should you choose? Whenever you sign up to exhibit at a new trade fair, conference or exhibition, you will usually be sent a detailed ‘Show Guide’ which outlines all the things you need to know to get the most out of your investment. Most show guides also list a wide range of exhibition stand contractors who can help you with some or all of tasks you will need to complete before the exhibition starts. As a first time exhibitor in a new location though, appointing a new supplier can be a stressful process. How do you know if your new partner will deliver against your objectives? 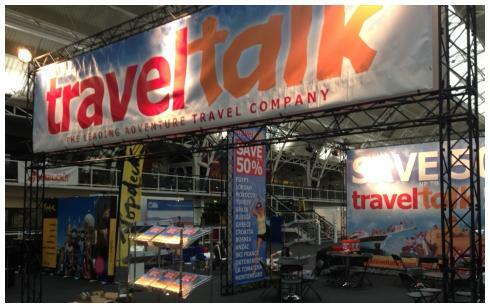 What’s more, a lot of the exhibition stand contractors in Show Guides are not vetted as such by the event organiser – they’re listed simply because they have paid for the advertising space! Conseuqently, can they be trusted? Quite often therefore, it pays to do your research first. Any exhibition stand contractor worth its salt will be more than happy to provide references from satisfied clients. Ask to speak to some of their clients on the telephone and check that they deliver all the services that the contractor’s marketing materials promise. Also check that the company has experience in your geographical area and make sure that they have experience in managing projects a long way from their home base. International experience will prove that the company has excellent connections and can source any third party service which you might require – breadth of network is crucial in the exhibitions sector. Lastly, shop around for quotes. If the quote is too good to be true – it probably is. Select your supplier on the basis of value and not price. Peace of mind is a valuable commodity, especially if a new exhibition has the potential to deliver so much. More and more organisations are outsourcing their exhibition management needs to 200m2, thereby mitigating their risk and reducing their costs. By making 200m2 your trusted exhibitions partner, you will be free to focus on your core business, secure in the knowledge that your exhibition needs are being expertly attended to. Call us on +44 20 3332 0092 to find out more.